There have obviously been a few games that were somewhat memorable in later years. I was chastised, for example, for waking up the house when Mark Brunell connected with Santana Moss some time near midnight back in 2005 to beat the Cowboys. But if you look at the results of, say, the last 10 years, none of the games really provide any memories of any consequence. Last year for example, the Redskins lost both games. The year before? Same thing. 2015? They lost the first one, then won the last game of the season to make the playoffs 34-23. But the memory of that game wasn’t the fact they beat the Cowboys. The Redskins could have been playing the Canadian Royal Mounties and the intensity of fans would have been the same. We all wanted the Redskins to finish the season with 4 straight wins, finish with a winning record, win the division and make it to the playoffs. It didn’t matter at all who they beat to accomplish it. They split in 2014, lost both in 2013 and swept in 2012 in the midst of a 7-game winning streak that also got the Redskins into the playoffs. The story in all 7 of those games was Robert Griffin III and the team finally making the playoffs. Not the rivalry. I kept going back in the record book until I’d gone back a decade. Some years Dallas swept. Some years the teams split. But in all those games over the 10 year period, I can’t say any one game stood out because of the intensity of the rivalry. 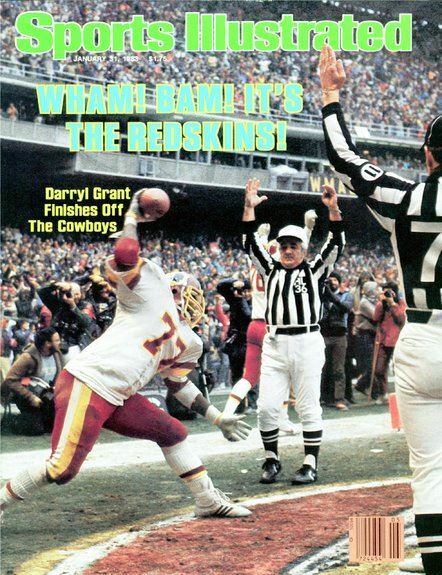 There were no memories of Joe Theismann dancing around in the end zone with the football over his head, clock still running, and all of us having out hearts in our throats fearing someone would hit him, the ball would come loose and Dallas would recover for a winning touchdown. Or Dexter Manley knocking Danny White out of a playoff game. There were no memories of plays like Kenny Houston tackling Walt Garrison right at the goal line in the final seconds to hold on to a win. Or Staubach breaking our hearts with a touchdown pass to win by one stinkin’ point. Or even John Riggins running wild to avenge a previous last-second loss. Not even a Darrell Green running down a Tony Dorsett. They were just routine, run of the mill, football games. Nothing memorable. Nothing special. So I love to watch all those old clips of back in the day when Washington and Dallas used to fight it out tooth and nail twice a season. It’s what made a lot of us Redskins fans, going all the way back to the days of Sonny Jurgensen, Charley Taylor, Don Meredith and Calvin Hill. But those days are gone. It's a new day, new team, new league, new atmosphere. No matter how much you want it to be like the old days.